Skiathos island offers a wide choice of things to see and do, boasting an amazing combination of fertile mountains and golden beaches with crystalline deep waters. On the northern coast there are untouched, private coves with amazing scenery and peaceful atmosphere, while in the south you can enjoy organized beaches with golden sand and many facilities. In Skiathos Town there are a lot of nice accommodation choices, like our lovely Skiathos hotel, close to popular beaches and all tourist amenities. While in Skiathos island, a great way to spend one day is taking a boat trip to inaccessible parts of the island, such as the exotic Lalaria. 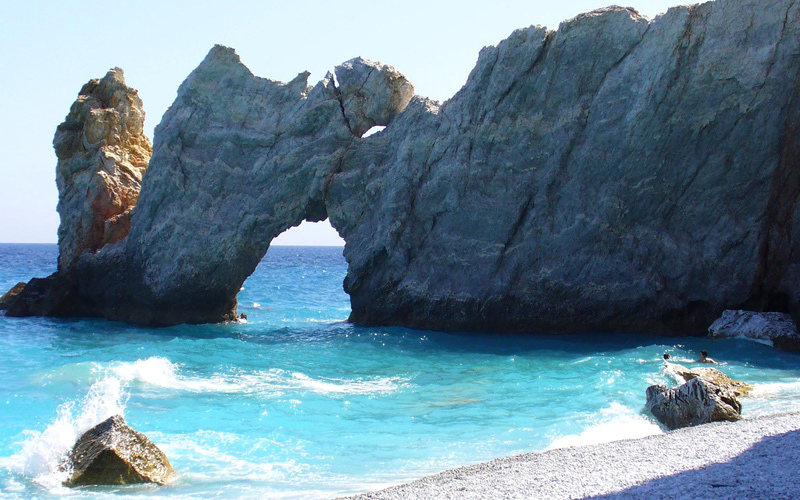 The southern side of Skiathos island is lined up with wonderful shores with crystalline emerald waters. The most famed of them all is Koukounaries, a long sandy beach attracting a great number of visitors, due to its natural environment, including a thick pine forest, and organized facilities. The sandy Banana, located near Koukounaries beach, is equally popular, especially among young people, provides lively bars and taverns and is frequented by naturists. 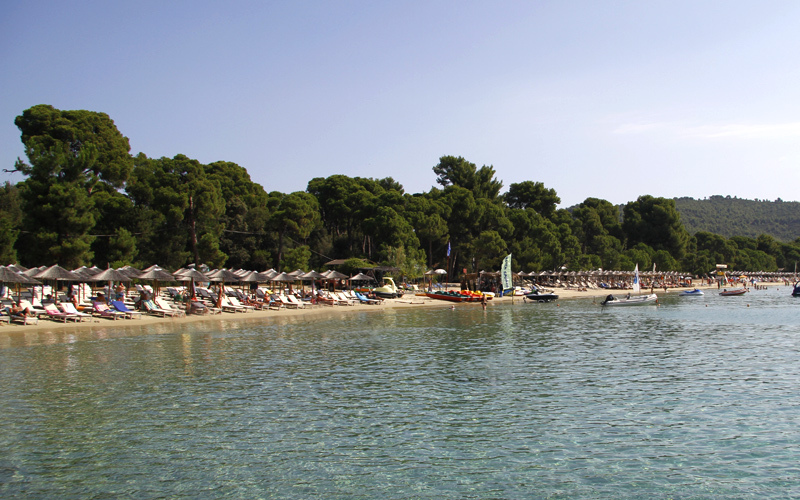 Just 8km away from Skiathos Town, Vromolimnos is another lovely beach you shouldn’t miss. It has breathtaking surroundings and is excellently organized. Megali Ammos, where our Skiathos hotel is found, is also one of the most beautiful beaches on the island, perfect for water sports and swimming. In Skiathos Town, the main village and port of Skiathos island, there are many options for both relaxing and active holidays. The centre of the town is ideal for romantic walks past beautiful white houses and paved alleys. Admire the beautiful architecture of the elegant mansions around town and visit the interesting museum of Papadiamantis, a celebrated 19th century Greek author, which exhibits original folklore items from his lifetime. 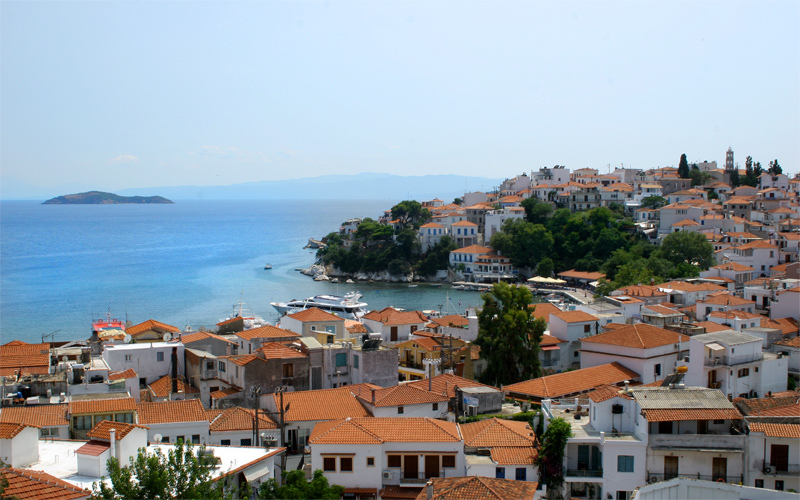 In Skiathos Town you can also enjoy shopping, especially at Papadiamantis street and the old quarter, bustling with little creative shops, souvenir kiosks and boutique stores, and dining in excellent restaurants and traditional taverns. In the evening, stroll along the promenade around the scenic port and have a lounge drink or coffee in one of the chic cafes and bars, or stay up until late dancing to the loud music of one of the clubs. A must-do activity in Skiathos island is a boat trip to the magnificent landscape of Lalaria. Located on the northern part of the island, accessed only from the sea, Lalaria is a unique secluded beach with round soft pebbles and extraordinary rock formations. The deep blue waters, in contrast to the white colour of the beach, create exotic scenery and are perfect for swimming and snorkelling. Along with Lalaria this amazing boat trip includes a visit to the ruins of the medieval castle town of Skiathos, where you can still see part of the walls and some churches.